Real Warriors Real Strength – Virginia Prevention Works! If you or someone you know is experiencing thoughts of suicide, call the Military Crisis Line at 800-273-8255 and press 1. You will speak with a trained counselor who can provide confidential support for service members, veterans and military families. If you need help finding resources for other psychological health concerns, explore our “Seek Help, Find Care” page. 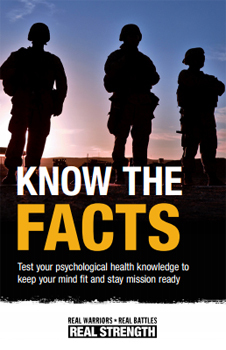 The Real Warriors Campaign’s “Know the Facts” booklet helps service members and veterans who are coping with invisible wounds stay mission ready. This booklet includes a psychological health quiz, information about seeking care and a checklist for warning signs of psychological health concerns. Order or download the booklet through our online shopping cart for your Suicide Prevention Awareness Month events. After sustaining life-threatening injuries in Afghanistan, Maj. Jeremy Haynes overcame physical and invisible wounds with the support of his family and health care providers. If you are a Real Warrior who is maintaining a successful career after reaching out for support or treatment for invisible wounds, share your story with us. Suicide Awareness Voices of Education (SAVE) increases public awareness and understanding about psychological health concerns by providing educational tools, professional training, community grief support and online resources. During Suicide Prevention Awareness Month, learn about SAVE training and resources. Previous PostI need a plain language translation for the naloxone regs! rethink vape campaign – free resources!